There were 701 press releases posted in the last 24 hours and 153,512 in the last 365 days. DIAMOND BAR, CALIFORNIA, USA, September 10, 2018 /EINPresswire.com/ -- The VoxMicro Group is proud to present its AIRETOS® branded E95 Class modules; a reliable, long-lifespan family of wireless adapters that transform the entire Qualcomm-Atheros QCA95xx/AR95xx series of client chipsets into a full portfolio of modular solutions. The E95 Class comprises a total of 14 base models. The AIRETOS® E95 Class supports high-end wireless link configurations that can use a full range of enterprise level protocol features, like CCX and FIPS-loopback compatibility. This, in tandem with the hardware variant options at the industrial and military operating conditions range make the E95 Class a gamut of choice for designing and completing all kinds of applications in the Outdoor IIoT and Industry 4.0 IoT verticals. The E95 Class provides great options for Smart Cities Infrastructure, Agriculture and Energy, Transportation and Mobility Solutions, Drones & Robotics, Medical & Healthcare Devices, Smart Environment and Habitation Spaces Sensor Aggregators, Automotive and Aerospace Networking. The Class’s Series H, X and G evolve Qualcomm-Atheros’s Reference Design Peacock using the AR958x and AR959x chipsets with new powerful Front-End-Modules (FEM) to enhance performance. Multiple-In, Multiple-Out (MIMO). The Class’s Series F offers entry-level WiFi+BT4.0 combo connectivity based on the Qualcomm-Atheros QCA9565 IC at the new small NGFF (M.2 PCIe) form factor, with Worldwide Regulatory Approvals. 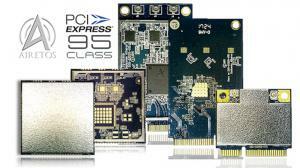 The E95 Series F is a cost-effective solution for wide-distribution Consumer Electronics Applications. The AIRETOS® E95 Class is compatible with Linux ATH9K and extended Windows and Android driver support. VoxMicro is an innovation-oriented, global partner for RF Materials to Product Design Centers, Electronic OEMs and Contract Manufacturers, with its focus on proactive supply chain, obsolescence management and component lifecycle. The VoxMicro Group is proud to deliver customer-centric experiences, aided by in-house digital, RF-calibration and regulatory expertise thus adding quality and value to dedicated technology fields.